Yesterday morning I went out for a 4.8 mile run that took a lot more out of me than I'd expected. I recovered quickly from that, and a few hours later, my son and I headed to Trailview State Park for a hike. The weather was chilly and we did our best to dress for the cold while planning for the heat we'd generate during the hike. We chose the path on the left and followed the winding trail up a few steep rises. The maintenance that was done after hurricane Sandy left many sections of cut-up tree trunks along the way. My son stopped to count the rings from one tree and determined that it had stood about 35 years before it was knocked down by the storm. 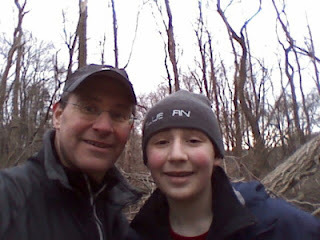 My son and I continued north until we reached the point where the trail overlooks the road separating Trailview from the southern end of Stillwell Woods. 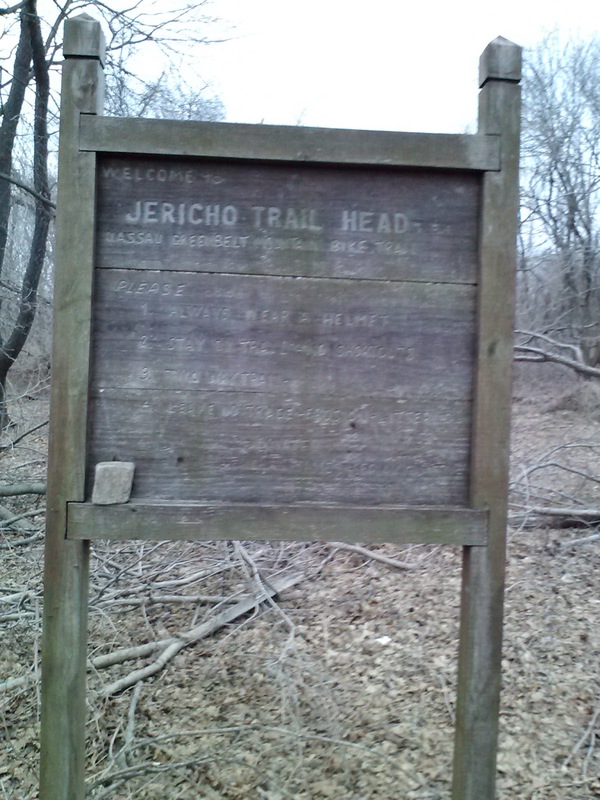 We followed the trail down to where Woodbury Road and Syosset-Woodbury Road intersect. We then crossed the street and entered Stillwell where we negotiated some difficult hills covered by gnarly roots and sharp rocks. We reached a point on the trail that had a substantial drop and decided to double back towards Trailview. We crossed Syosset-Woodbury Road and re-entered Trailview through the western trail head. 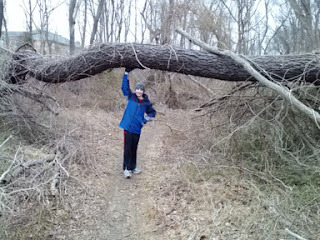 We followed a different path for a while, stopping a few times to explore interesting rocks and large branches. 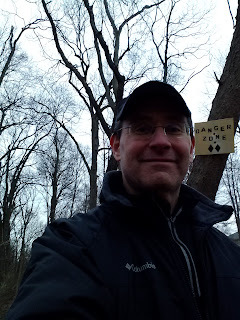 We found ourselves at a place marked "Danger Zone" and I asked my son if we should continue. He's a 13 year old boy. Of course he said yes. The danger zone required some deft footwork but we made our way through it without incident and eventually picked up our original trail. It was there that we found a flat square rock that my son decided to keep as a souvenir of our hike. We finished our walk and went over to the Stop & Shop that's located adjacent to Trailview's parking lot. We bought some goodies in the bakery section to surprise my wife and daughter who were waiting for us back home. Between my morning run and the hike I covered close to ten miles outside yesterday, exceeding 17K steps. The best part, for me, was spending time with my son. We had great conversations and took on some tough hills. I slept eight hours last night with 97% sleep efficiency. Gee, I wonder why. Such a great father-son day! Most awesome! I bet the girls were glad to have you back home, especially bearing carbohydrates! They were had been on their own adventure (the shopping kind) that afternoon. And yes, the carbs were very much appreciated!